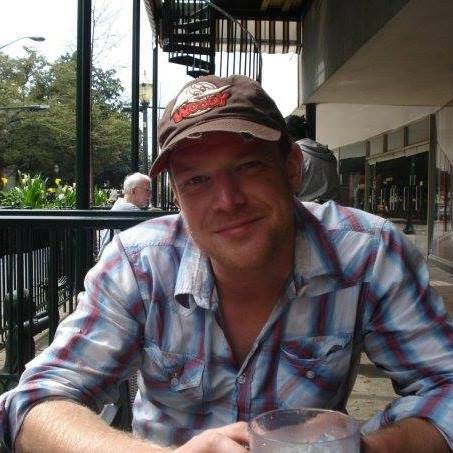 Why go to The Edinburgh Fringe Festival? Every August, the classy folk of Edinburgh - the kind that wears tweed jackets with bow ties, resemble university lecturers and speak with a hint of an English accent run for the hills in fear their comfortable little lives will be hijacked by a bunch of fun-loving anarchists! That’s because ‘The Athens of the North’ grinds to a halt for the Fringe Festival - the largest arts festival in the world. Comedians, musicians, dancers, circus performers, poets and art-loving tourists descend upon Scotland’s capital city and turn it into a haven of fun, creativity and late-night revelry. 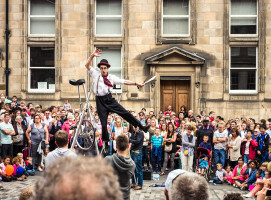 What makes Edinburgh the best Fringe Festival in the world? Comedians and artistes plan, write and rehearse all year because Edinburgh Fringe Festival is Britain’s Hollywood and X-Factor all rolled into one - impress the notorious Scotsmen critics here and you can make it anywhere… and this is your chance to see the best well-known performers and the next generation of stars blossom. 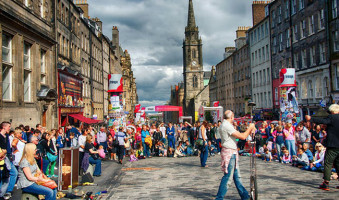 It’s not all stand-up comedy and cabaret, there are plays to delight children’s imaginations, haunted walking tours, traditional foot-stomping Scottish music, massive open-air bars with stalls selling scrumptious street food to while away the balmy August evenings before drinking the night away laughing, singing and dancing. We guarantee you’ll make a host of new friends while pogo-ing to The Proclaimers! So do yourself a favour, take the whole of August off, like the French do and get yourself to Edinburgh for a side-splitting, jaw-dropping, eye-opening, heart-warming August. Or just go for the week or weekend. Visit beautiful Edinburgh - the "Athens of the North"
Get cultured while having a drink or three!